The event of Easter is considered as one of the auspicious and holy event for the Christians. It was on this day Lord Jesus was resurrected after his crucifixion. Thus this day is celebrated as it is the day that symbolises hope and happiness. Thus the whole Christian community across the globe look at this day with aspirations and expectations. Hence it is the day of merrymaking and grand feasting. Once the morning church service get over, it’s time for a grand Easter feast, which has both mark religious as well as social connotations attached. Though Easter is celebrated in most identical manner everywhere in the world, but still slight variations still prevail due the regional ritualistic differences. But the traditional menu which is prepared for Easter feast remains almost similar throughout. The ingredients and mode of preparation of these scrumptious recipes are almost similar and the preparations begin days before the arrival of Easter. However in some part of the world, a grand get together is arranged at some common place and a grand feast is held there mainly during the dinner time whereas at other places, the Easter feast is held at the church itself. Basically people savour upon this sumptuous lunch after a long observation of Lent. Thus Easter dinner finally comes up with an ideal opportunity for people to hover upon their favorite Easter dinner recipes. Even those who do not Lent, they as well look upon this grand feast as one of the most awaited get-together of the year. This time also serves as the perfect time for food lovers to try out some delicious Easter recipes thus to satiate their taste buds. The traditional Easter feast mainly comprises of the typical menu of chocolate bunny cakes and that of baked chicken. Peanut butter cookies and Greek lamb should not be given a miss. 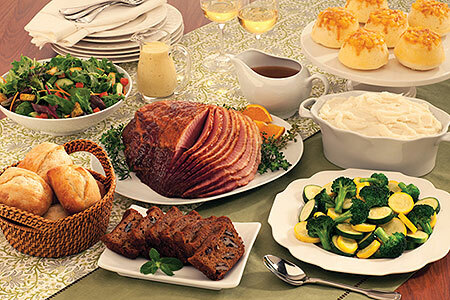 Assorted Rolls with Butter, Smoked Ham with Cranberry Chutney, Cheesecake with Sliced Strawberries, and Dilled Peas and Potatoes Vinaigrette are also some of the popular items listed for the Easter feast. Easter dessert recipes are also wide ranged some amongst them are chocolate carrot cake, candy strawberries, banana pan cake, marshmallow peeps cupcakes and many more. However, it should be noted that the nowadays not only the Easter feast are limited to these traditional recipes, a wide variety of recipes are also served on the occasion. Nowadays there are varieties of food outlets which timely serve and deliver all the possible Easter recipes right at your doorstep. But preparing them for oneself can be so much fun. So many people prefer cooking these special Easter recipes by their own, for their loved ones. Baking the Bunny cookies for kids and the special Easter Lamb Cakes for someone very dear can be so much fun as well fascinating. So those who are planning to arrange a grand Easter feast back home, you can choose the recipe from the recipe section and start on preparing it. So what are you waiting for? Start feasting, after all its Easter!